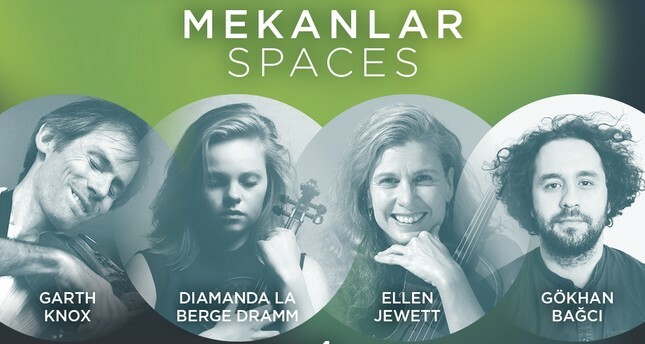 As part of the Baroque & Modern concert series, Spaces by Garth Knox and Diamanda La Berge Dramm will take place on Feb. 4, 2019 at 6:30 p.m. in Evliyagil Museum in collaboration with Klasik Keyifler (KK). The first week of February brings an exciting project to Ankara for all those interested in the newest trends in classical music. Garth Knox, who is one of the most prominent violists of our age, has worked intensively with many of the world's leading composers including Ligeti, Schnittke, Berio, Kurtag, Stockhausen, Cage and Lachenmann, and performed ground breaking premiers. He was a member of the Arditti Quartet for many years and he is currently working as a visiting professor at the Royal College of Music in London. In recent years, he dedicated his time and effort to string pedagogy and the innovation of extended techniques for string instruments. Dutch violinist Diamanda La Berge Dramm, to whom Garth Knox dedicated his composition "Violin Spaces," is known as one of the leading artists to define new age classical music in the Netherlands. For the concert which is hosted by Evliyagil Museum; Bilkent University Faculty of Music &Performing Arts and Klasik Keyifler, a non-profit local organization known for their support of young musicians and composers, is collaborating also. In the concert that will take place in Evliyagil Museum on Feb. 4, violinist and KK founder Ellen Jewett and cellist and KK co-director Gökhan Bağcı will join on the stage to Knox and Dramm to perform Knox's composition "Satellites." Turkey's important young musicians Kerem Tuncer, Dinç Nayan, Yiğit Vural and İdil Bursa will join the performance with Knox and Dramm to perform another composition by Knox named "Nothing But the Truth." Knox and Dramm, who work together with young composers and string players from around Turkey will perform a final concert at the Evliyagil Museum. This event is part of the concert series Baroque & Modern, organized by Evliyagil Museum and Klasik Keyifler. The admission is free.